The Pioneer Venus Orbiter incorporated a payload of 12 scientific instruments one of which was a fluxgate magnetometer provided by Chris Russell of UCLA, the principal investigator. Previous flybys of Venus had revealed that the magnetic field of Venus was much weaker than Earth’s. 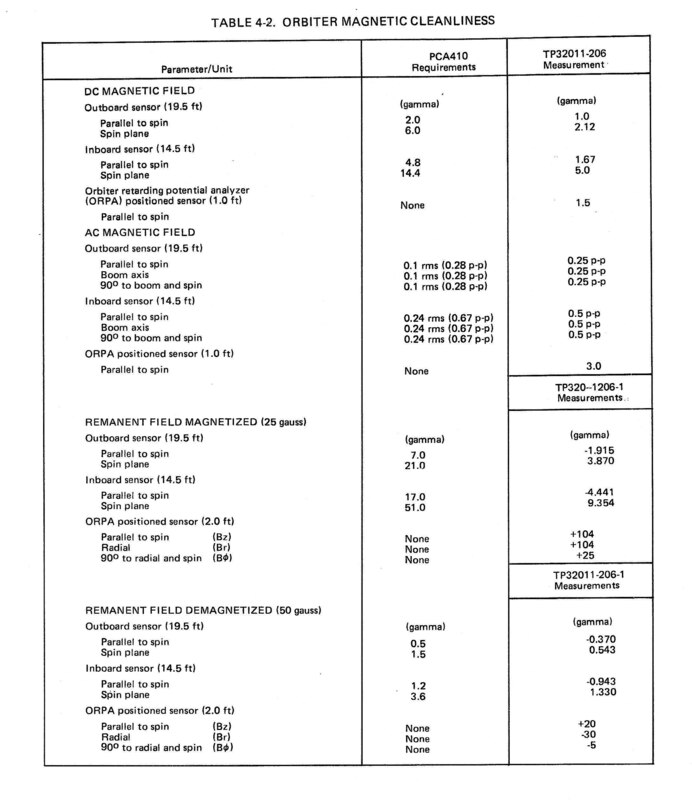 The resulting system requirements for the Orbiter magnetic fields are shown in Figure 4-2 in Reference 1. The most challenging requirement is that the remnant field at the magnetometer (after a 50-gauss demagnetization of the spacecraft) be 0.5 gamma or less. A Gauss is the usual measure used in magnetics—a gamma is 0.00001 Gauss. The earth’s surface magnetic field varies from 0.3 to 0.6 Gauss. These requirements presented some issues that Hughes had not dealt with previously. At the beginning of the PV program no one at Hughes that I knew had experience in this area. Very fortuitously at this time we received an application from a TRW engineer, Chris Thorpe, who had performed these tasks for the TRW Pioneer spacecraft and had worked with Chris Russell previously. We hired him very quickly into the Perry Ackerman lab and assigned him to PV program. Chris was a delightful Englishman with a wry sense of humor and supported me in systems engineering and Tony Lauletta in science integration throughout the program. Limiting the type and amount of magnetic materials used in fabrication. Controlling the location and orientation of magnetically troublesome units on the equipment shelf. Based on Chris’ calculations the boom length was set at 15 ft 6 in. (4.72 meters). As I recall Chris’s prediction was 14.5 feet and one foot was added to provide some margin. Chris maintained the magnetic model throughout the Orbiter development. 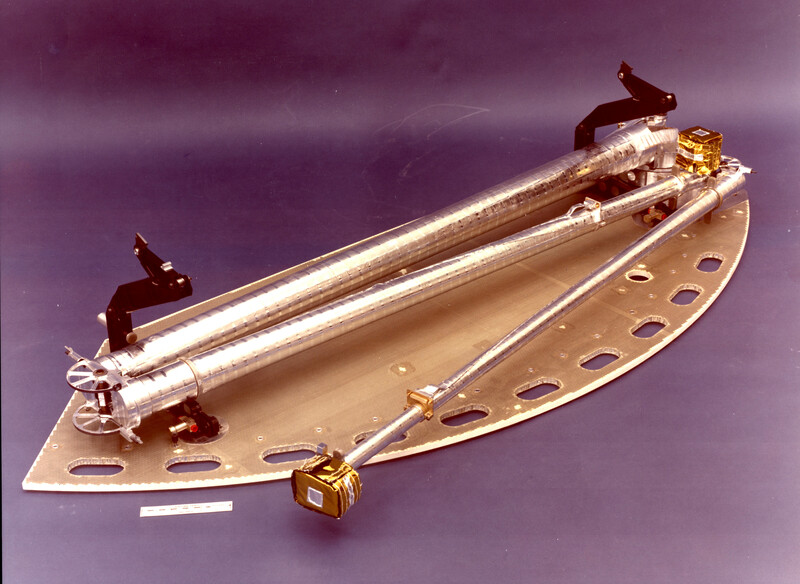 The boom, consisting of three hinged segments, is folded together and stowed on the orbiter shelf until deployed shortly after launch. The boom is secured by two redundant pyrotechnic pinpullers either of which when fired would release the boom for deployment. As the three segments extend, each hinged joint locks in the deployed position. A spin rate of 6.5 rpm provides the centrifugal force that ensures deployment and positive latching. System level testing of the magnetometer boom proved to be problematic. The boom root hinge, when pyrotechnically released, was to deploy with the spacecraft spinning at 6.5 rpm. However, aerodynamic drag prevented the boom from fully extending in sea level density air. In order to validate the design it was necessary to encapsulate the spacecraft in a large plastic tent filled with 90% helium that provide a gas mixture with one fifth the density of air. The deployment test in this environment was successful. Two system level magnetic tests are required—remanent and stray field determination. The remanent test is to determine the magnetic field of the quiescent spacecraft and requires a magnetic coil to cancel the earth’s magnetic field. The NASA Ames facility Magnetic Standards Laboratory and Test Facility in Mountain View, CA was used for this test and of course this required shipping the spacecraft to that facility. Tests were conducted with the spacecraft in a magnetized and demagnetized state. The stray field test to determine the magnetic field of the operating spacecraft was conducted in the Hughes high bay in the early morning to provide a magnetically quiet environment. The test results are presented in Figure 4.2 in from Reference 1. Chris Thorpe oversaw these tests. According to Chris Russell: The most definitive measurements of the magnetic moment of Venus were obtained during the Pioneer Venus Orbiter mission in its first years of operation (1979-1981). Repeated low-altitude (~ 150 km) passes by that spacecraft over the antisolar region, coupled with dayside observations to the same altitude, proved the insignificance of a field of internal origin in near-Venus space. The observed fields for the most part could be explained as solar wind interaction-induced features. The new upper limit on the dipole moment obtained from the Pioneer Venus Orbiter wake measurements placed the Venus intrinsic magnetic field at ~ 10-5 times that of Earth. At the conclusion of the Pioneer Venus program Chris and I were assigned to the newly started Galileo probe effort. After I left Galileo I lost track of Chris. Recently I learned that he passed away in 2000 at the age of 76. If someone can provide any biographical details for Chris I can add them to this post. Reference 1. Pioneer Venus Final Report, Contract No. NAS 2-8300, December 1978, Bernard J. Bienstock.